ABS light on in your Corvette? We repair the Delphi ABS units found in the 2001-2004 Corvette, Pontiac Bonneville, and Cadillac Deville. These units usually fail due to a faulty relay integral to the ABS control module producing a C1214 error code. Other repair shops simply resolder the old relay and hope for the best for the same price or more. We replace it with a NEW relay (the original Tyco part, not a cheap replacement). Let us do it right for you the first time. $139 + S&H. 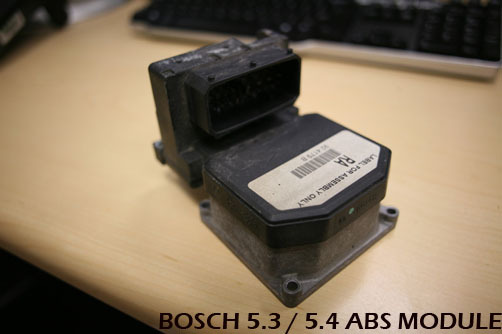 Bosch 5.3 ABS modules are found in the 2000-era Chevrolet Camaro and a few Corvettes. We do not service the Delphi units found in most Corvettes at this time. To verify that the ABS module from your Camaro can be rebuilt, compare it to the picture below, and then click on the order link above to send yours in for a rebuild. Click here for Chevy Trucks and SUVs. 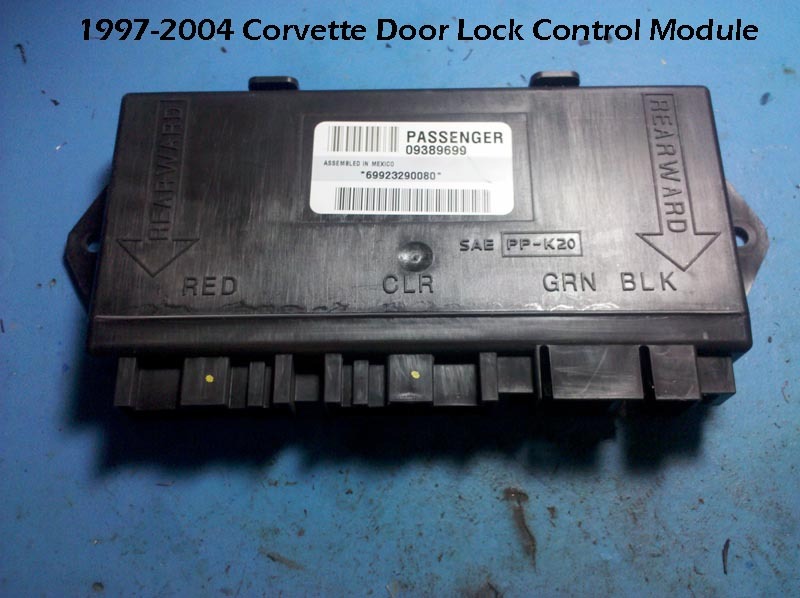 We can fix the door lock control modules on 1997-2004 C5 Corvettes. These modules are located inside the door panels and are very easy to remove. They have relays inside that commonly fail (if you listen closely you can hear them click), causing the door to either not unlock or lock with the remote (key fob) or switch. Often the problem is intermittent. Unlike other Corvette specialists, we actually replace all the relays inside, not just the defective one, with high quality replacement parts to ensure long lasting operation. Like our ABS rebuilds, we warranty the Corvette door lock modules for life. If you would like us to service your door lock module, simply remove the door panel and unscrew the control module (held with Torx screws), unplug the connectors, and fill the order form out below for shipping instructions. If your power windows aren't working normally either, contact us - we have a solution! The cost is $69 + shipping ($11 in the US, $21 to Canada, and $38 worldwide). If you would like to send both door modules in for repair (Driver + Passenger), there is a $20 discount. 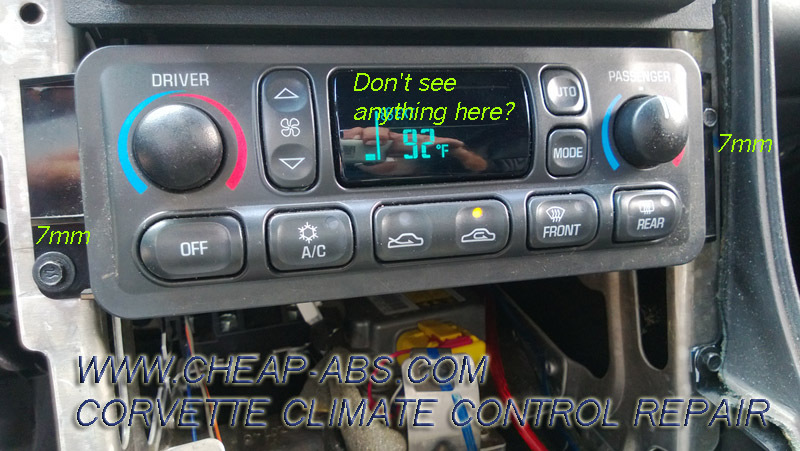 We can repair the faulty/dim backlights in your LCD display so you can actually use your climate control system again! To remove, unscrew the armrest and remove it, pull out the plastic piece that the traction control button sits in and disconnect the wiring, pop off the two covers in the armrest console, and remove the 4 10mm bolts that hold the center console on, slide the center console back and remove it, remove the T15 torx screw behind the grill next to the ignition switch, loosen the shift boot by squeezing its sides gently,and lift the center console trim piece out, and remove the climate control unit by removing the two 7mm bolts shown in the picture below. If you do not see your model listed here, please contact us for more information. Copyright 2017 Cheap ABS, Inc.